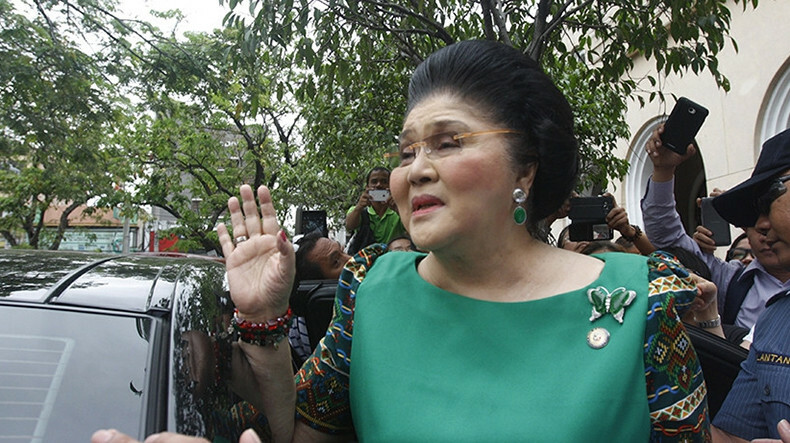 A Philippine court has found former first lady Imelda Marcos guilty in multiple corruption cases. It ordered her arrest on Friday in a rare conviction that she is likely to appeal to avoid jail and losing her seat in Congress, Al Jazeera reports. The special anti-corruption Sandiganbayan court sentenced Marcos, 89, to six to 11 years in prison for each of the seven counts of violation of an anti-corruption law when she illegally funnelled about $200m to Swiss foundations in the 1970s as Metropolitan Manila governor. During the US-backed dictatorship of Imelda's husband, Ferdinand Marcos, the family is said to have amassed an estimated $5bn to $10bn in hidden wealth. No one has issued any reaction on behalf of Marcos, although her lawyers were expected to appeal the ruling, which activists and human rights victims welcomed as long overdue. The court disqualified Marcos from holding public office, but she can remain a member of the House of Representatives while appealing the decision. Her congressional term will end next year but she has registered to run to replace her daughter as governor of northern Ilocos Norte province. "I was jumping up and down in joy in disbelief," said Loretta Ann Rosales, former chairwoman of the Commission on Human Rights, who was among many activists locked up after Imelda's husband, former president Ferdinand Marcos, declared martial law in the Philippines in 1972. Rosales said the decision was a huge setback to efforts by the Marcos family to revise history by denying many of the atrocities under the dictatorship and urged Filipinos to fight all threats against democracy and civil liberties. Imelda Marcos' husband was overthrown by an army-backed "people power" revolt in 1986. He died in exile in Hawaii in 1989 but his widow and children returned to the Philippines. Most have been elected to public offices in an impressive political comeback.